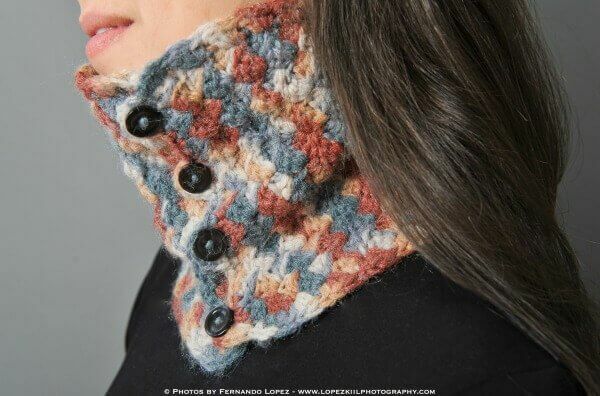 This crochet neck warmer pattern was one of the first patterns in my shop and has long been one of my favorites (I still wear it!). It has all the warmth of a scarf but without the bulk. This versatile wrap can be worn in numerous ways including fully buttoned, folded over, draped in the front, or with a twist. And the textured stitch pattern looks great with both variegated or solid yarn. My goal for this year is simplicity, and that applies to my business to; so I thought I would scale back a bit on the items in my shop. Since this neck wrap was one of my first items, I thought it was time for a well deserved retirement, but of course wanted to keep it available to my lovely readers. Gauge: 16 sts and 11 rows = 4 in. Finished size with a G hook measures approximately 18¾ in. × 7¾ in. (about ¼ in. larger with an H hook). Row 1: Starting in 2nd ch from hook, work 1 sc in each ch across, turn — 28 sts. Row 2: Ch 1, [1 sc, 1hdc, 1dc] in first sc, skip next 2 sc, *[1 sc, 1hdc, 1dc] in next sc, skip next 2 sc, rep from * 7 more times, work 1 sc in last sc, turn — 28 sts. Row 3: Ch 1, [1 sc, 1hdc, 1dc] in first sc, *skip next 2 sts, [1 sc, 1hdc, 1dc] in next sc, rep from * 7 more times, work 1 sc in last sc, turn — 28 sts. Rows 4 through 52: Repeat Row 3 for pattern ending at Row 52, or until desired length, turn. Begin edging in last st of Row 52. Round 1: Ch 1, work 1 sc in each of the first 4 sts, *ch 2, skip 2 sts, work 1 sc in each of the next 4 sts, repeat from * across, work 2 more sc in last st; **rotate piece and work sc evenly across side edge, work 3 sc in corner, repeat from ** across next 2 sides. Round 2: Work 1 sc in each of the first 4 sts, *work 5 sc in ch-2 loop, work 1 sc in each of the next 4 sts, repeat from * three more times, slip st in corner to join and fasten off. Do not continue edging around remaining 3 sides. Buttons are sewn on the side opposite your button loops, approximately 1 in. in from the edge. Use stitch markers to mark proper placement of the buttons and double check that they align properly with the button loops. Using a sewing needle and matching thread, sew buttons in place. Professional photos courtesy of Lopez-Kiil Photography. Previous Post: « Hookin On Hump Day #89: Link Party for the Fiber Arts! 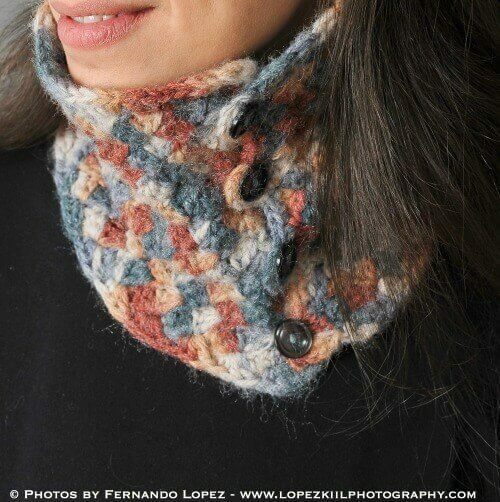 So often I gravitate to the big, bulky cowls, but I’m loving this with the worsted weight yarn. Very pretty! My husband has been asking for something like this for when he rides his Harley. I’m going to see if he likes the button look first before I start though. What yarn did you use? Its delicious!